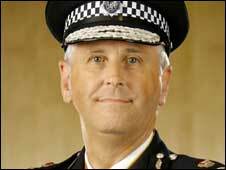 The chief constable of the West Midlands has announced he will step down after seven years in the post. Sir Paul Scott-Lee, 55, took up the role in September 2002 and has told the police authority he has decided not to renew his contract in May. A police spokesman said Sir Paul had not made clear what his future plans were but that he would leave the post. The spokesman added that Sir Paul had "definitely not been pushed out" and the decision had come as a surprise. In a statement to the press, the Coventry-born chief constable said: "This is undoubtedly one of the hardest decisions I have had to make in my career. "It has been a tremendous privilege to lead West Midlands Police and it is with great pride that I reflect upon the successes achieved during my time as chief constable." This is undoubtedly one of the hardest decisions I have had to make in my career. Sir Paul, who was knighted last year and awarded the Queen's Police medal for distinguished service and gallantry in 1997, added: "This would not have been possible without the unstinting support of the Police Authority." Among the high profile cases he has dealt with were the murders of Letisha Shakespeare, 17, and Charlene Ellis, 18, shot dead outside a party in Aston on 2 January 2003. In July 2005 he gave the order to shut down Birmingham city centre for 10 hours after suspect packages were found. The packages were not explosives but it followed the London public transport bombings and his decision was backed by the home secretary at the time, Charles Clarke. Sir Paul also investigated the death of Michael Todd, Chief Constable of Greater Manchester Police, earlier this year. Diana Holl-Allen, chairman of the Police Authority, said Sir Paul's decision to leave the force was "a very sad day - both for the force itself and for the people of the West Midlands."